Had the first slice for dinner and the rest will be my lunch at work at $3 per serving. When I was in high school I subscribed to Vegetarian Times magazine to find new recipes to try and this was my first lasagna recipe and still my fave! I make it once or twice a year now. It takes a little time to prepare because you have to caramelize the onions for 30 minutes, but this white sauce lasagna is absolutely delicious! Caramelizing onions brings out their amazing natural flavor. You need to cook the onions over low heat to get their natural sugars to slowly and evenly caramelize so don't stir them too much. They should be completely broken down to a deep brown, jam-like consistency. If the onions start to stick to the pan add a little water. White or yellow onions work fine, I wouldn't recommend red or sweet onions. I normally only buy yellow onions but was feeling adventurous this time and picked up a white onion but just didn't like it as much. If you have extra left over you can store it in the fridge to put over another dish. The onions make this lasagna, so you have to get this part down right and I didn't feel their directions really emphasized that. 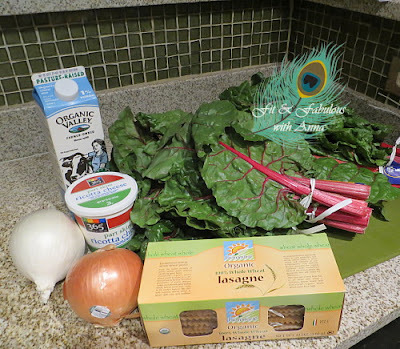 Also taste the chard/ricotta mixture before you layer it into your lasagna, if its not seasoned properly it's going to be bland in your lasagna - the taste is the same in your mixing bowl and in your finished product of lasagna. I bought all the ingredients at Whole Foods and I only consume organic dairy, so total cost was under $20. I saw for the first time whole wheat lasagna noodles so I gave it a try and it tasted just fine. It was a bit more effort to boil the noodles 4 at a time but not too much effort, however the nutritional value made it worth it. Vegetarian Times says it makes 12 servings, but I don't know how they came up with that? The most I could divide my pan was into 6 fair sized servings. Either they had a larger pan or the photo does not reflect the actual size of one serving. I double checked my protein numbers because it came up much higher than theirs but with my ingredients its correct. 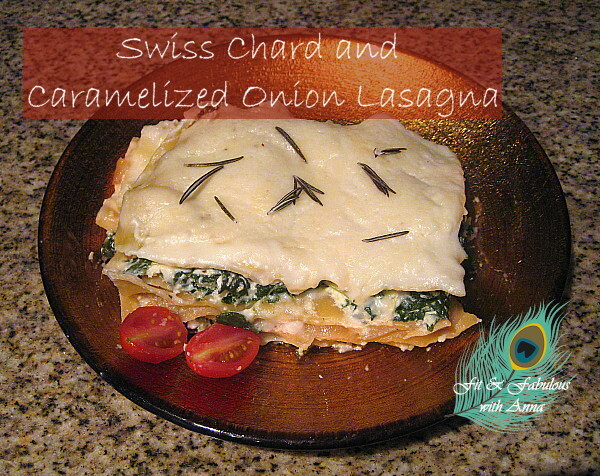 The protein comes from the whole wheat noodles, swiss chard (3.5g per cup), the cheese and milk. Swiss chard is high in Vitamins A&C and also has calcium and iron. This keeps me full for hours! The recipe calls for a little flour to thicken the white sauce and I only use King Arthur Unbleached All Purpose Flour which also has protein in it. I used to bake decorated sugar cookies for every holiday and bring them to work, so I did some research on the best flour and this brand was top rated. The type of wheat they use is superior and even though they don't bleach it white, just the oxidation process of it sitting in the bag turns it white, like an apple turns brown when exposed to air. So I've been loyal to this brand for years because test kitchens have just found it bakes better. I only used a third of the container of ricotta so I had to find another use for it. I put one tablespoon of it on my toast at breakfast and seasoned it with some oregano and pepper. It tastes pretty similar to cream cheese, just a bit bland. One tablespoon is only 20 calories and gives me some extra calcium and a little protein.